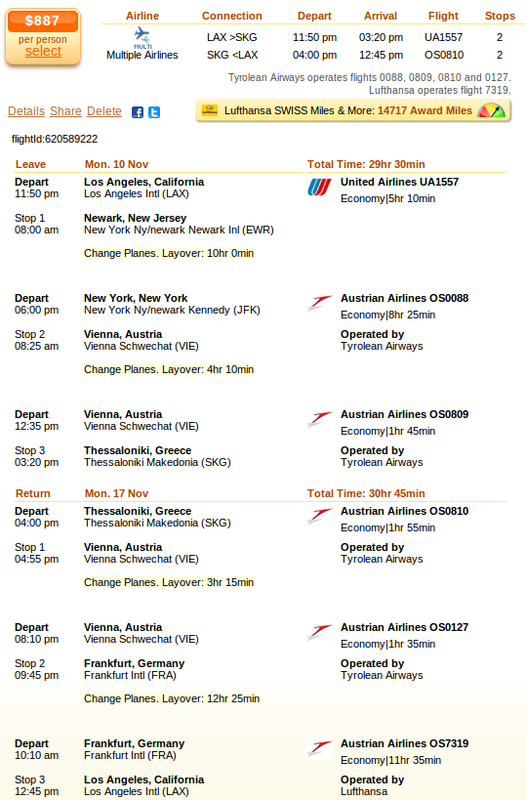 Get yourself a low travel season vacation in Greece with this Thessaloniki airfare from $887 r/t. Travel from Los Angeles in November on a multiple airlines flight jointly operated by United Airlines and Austrian Airlines and save on your flight deal. We have found this deal on Travelgrove, but it was originally provided by Flighthub and that is where you can book it. Check these two sites but also search on other merchants and maybe you will find an even better deal than the one we have found. Depart from Los Angeles International Airport (ORD) on November 10 and fly back on November 17 from Thessaloniki International Airport (SKG). The only disadvantage of this cheap flight deal is that it has two stops each way: the departing flight has a stop in New York City and one in Vienna, while the return flight has got one in Vienna and one in Frankfurt. Also, the frequent flyer program of the airlines will give you 14,717 award miles if you book this fare, almost 25% of a free flight from the US to Europe or vice versa. Book the multiple airlines flight we have found you today and you will pay $887 r/t, saving minimum $20 considering the prices of any other airlines. The next best offer is from Swiss International Airlines for $907 r/t. Check the top 5 airlines by price in the table. This entry was posted on Thursday, June 26th, 2014 at 9:56 am and is filed under Airfare Deals. You can follow any responses to this entry through the RSS 2.0 feed. You can leave a response, or trackback from your own site.